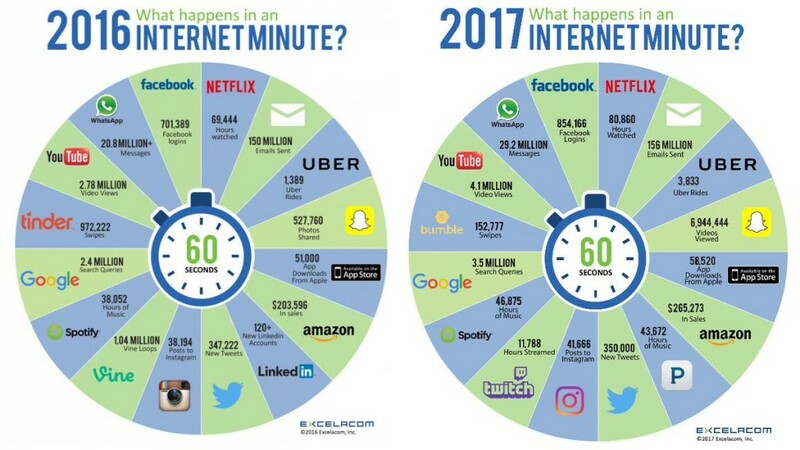 Excelacom has once again summed up What happens in an Internet Minute with a powerful infographic. We say powerful, but perhaps the better description is jaw-dropping. In 2016, our answer would have been 2.4 million searches on Google every single minute. Yes, per minute! In 2017, this number has risen to 3.5 million per minute. When you take a step back and consider how many minutes there are in a day (1,440, but who’s counting! ), the number of searches and the sheer volume of data it represents is shocking and mind boggling. In 2016 LinkedIn, Tinder and Vine made the list. They are noticeably absent in 2017. In 2017, there are some new contenders: Bumble, Pandora, and Twitch. Continued growth for Google, Facebook, Instagram, YouTube, Twitter, Netflix, Whatsapp, Amazon, the App Store, Uber and the ultimately, the number of emails sent every minute. And then we have Snapchat. Check out the year-over-year numbers, and you’re probably as amazed as we are. From a little over 500,000 photos shared every minute in 2016 to 7,000,000 (seriously, 7 million!!) every minute is unfathomable. What’s Special About These Numbers? Now that you’ve had time to review the Excelacom infogram and digest some of the numbers, you are probably asking yourself: what is so special about all these facts and figures? The data is proof that cyberspace is chalk-a-block full of bites and bytes. It reminds us that our websites, social media profiles and pages and text messages are but a tiny fraction of what happens online every day. The data also reminds us that search engine optimization (SEO) is important, but so is connecting on a human level. This infographic, and others like it, are proof that people of all ages know how to search. From public library computers to school classrooms, tablets to smartphones to smartwatches – we are more connected than ever before. Which is why making sure your online presence showcases not only your business, but your human side, is key. If you are looking for help with your website, your branding, your marketing or your digital content, connect with the team from Dalen Design. Our team is committed to bringing your vision to life!